Delikon EMI Cable Shielding Flexible Conduit solutions cover a range from heavy series over braided flexible metal conduit, heavy series water proof over braided flexible conduit to heavy series over braided liquid tight conduit. The over braided flexible conduits can be used for EMI, ESD suppression. The shielding flexible conduit comes in various sizes and its metallic, strong nature allows it to withstand any irregular pressure that may occur. Grounding can also be easily achieved with Delikon Heavy Series Fittings. The connector comes with a metal clamp, providing simultaneous attachment and grounding for the braiding. The connector is used as an end piece for cable shielding system. 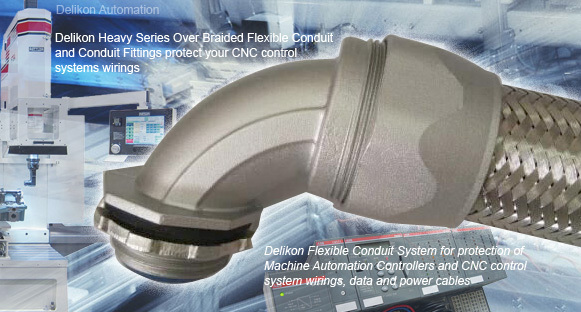 Delikon EMI Cable Shielding and ESD Suppressing Heavy Series Over Braided Flexible Conduit and Connector provide convenient solutions to protect automation cables from EMI that may be coming from outside components as well as provide environmental protection.